Wolf Pond is a scenic remote pond located off Boreas Road in the Vanderwhacker Mountain Wild Forest of the central Adirondacks. In 2005 the DEC had proposed to build a trail to the pond, however as of 2014 this hike still requires a bushwhack to reach the beautiful pond. The views from the shore of the pond include some of the high peaks featuring Redfield, Skylight, Marcy, Haystack and Basin. 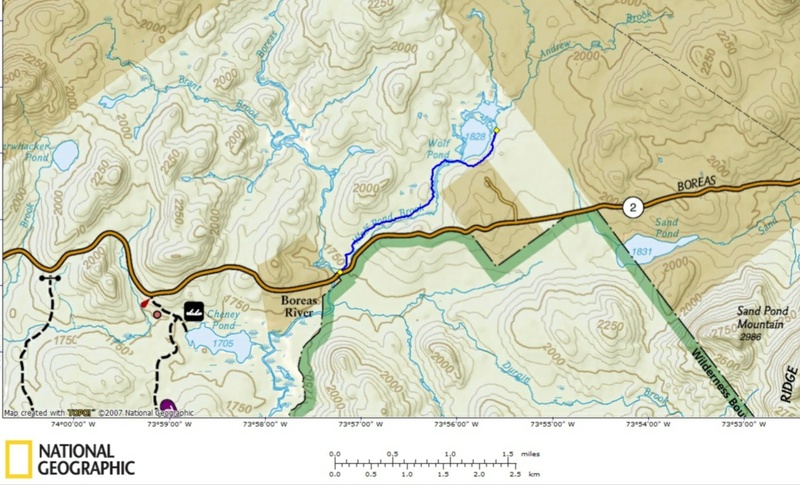 The start of the proposed trail will be located along Boreas Road, just east of the bridge over the Boreas River on the north side of the road at a large parking area. The GPS coordinates are N43 56.588 W73 57.265 for the parking area for those who have a GPS devise. There is a designated primitive campsite located at the parking area for those looking for some FREE camping. We believe that this will become a very popular hike once a marked trail is constructed. Otherwise this is a difficult bushwhack probably for some hikers. It is about a two mile hike from the parking area to the pond. Look below for a few pictures and map of this unknown gem in the Adirondacks.